Ceský ráj (Czech Paradise) Rock Cities is part of the Tentative list of Czechia in order to qualify for inclusion in the World Heritage List. Central Europe seems to offer nice autumn color viewings, and I thought I'd take an advantage of that and go to visit Cesky Raj (Czech Paradise) in Czechia in early November. Cesky Raj is actually a very large area with varied natural beauties, but the nomination has to do with the several Rock Cities within the area. My quick research before the trip revealed that out of the 10 proposed Rock Cities for inclusion, 2 are the main ones: Hruba Skala and Prachovské Skály, and the former is mainly for rock climbers and the latter is for tourists. Although I visited both and also the Trosky Castle ruin, the main attraction of Cesky Raj, located between the two Rock Cities, I explored Prachovské Skály more in detail by hiking. Prachovské Skály is supposed to be the oldest nature protection area in Czechia. I started hiking from the train station of Jinolice, went to the trail head of the Green Loop and ended hiking at the train station of Libun, which was near the pension I stayed at. The whole process took me about 6 hours, including one-hour lunch at a restaurant near the trail head. 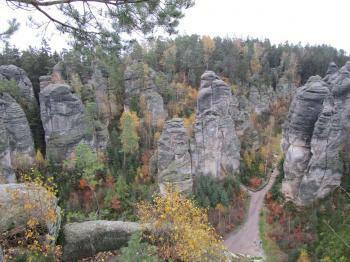 Prachovské Skály is basically a valley surrounded by towering rocks. This valley is comparable to Yosemite Valley in California or Lauterbrunnen Valley in Switzerland. Well, that may be a little bit of exaggeration, but the hike, for which I needed to go up and down and right and left, looking for the green markers, was indeed a lot of fun. The Green Loop took me from the bottom of the valley to the lookouts on top of some of the towering rocks. The autumn color was in its final stage but was still pretty. I notice Jinolice and Libun are connected directly to Prague by train that takes less than 2 hours. This train does not run every day but otherwise you can change train once or twice that takes less than 3 hours. So I believe it's quite possible to take a day-hiking trip from Prague to Prachovské Skály if you are willing to hike 10 to 15 km. But if you also want to visit the Trosky Castle ruin, an overnight stay in the area would be recommended. During the same trip I also visited the nearby city of Liberec and attempted to see the TWHS of the “Mountain-top Hotel and Television Transmitter” in Ještěd just outside Liberec. It was so foggy that day that I could not see it from the city center or from the foot of the mountain. These is a cable car that goes up the mountain, which would have certainly made it possible for me to see it, but the cable car was out of order that day, which was not even announced on their website! Due to time constraints, I could not hike up. So I failed to see it to my disappointment.